This 3D MOBA will never be the same again. On the topic of Paragon’s progress, hero designer Cameron Winston is completely candid. For months the developer has been pulling and pushing the game’s levers, attempting to select a nominal gear, but certain obstacles, namely game length, were immovable. Most matches were falling within the appropriate bracket of 30-50 minutes, but an unacceptable percentage refused to close out before a full hour or more had passed. Players would find themselves locked into skirmishes which refused to resolve, with neither side landing the killing blow. Remedies were applied, especially with regard to match times. Inhibitors were denied their ability to respawn and left permanently deactivated once destroyed. Minion strength was enhanced in order to force the issue. But in the end, none of Epic’s adjustments were effective. The map was simply too big to accommodate the studio’s vision, so it had to go. And so Paragon finds itself undergoing its most dramatic set of changes to date: the Monolith Update. The result: an Epic-sized overhaul. The old map, now known as Legacy, has been replaced by fresh, smaller arena with a revised shape designed to encourage specific roles (caster, support, adc) into more traditional lanes. This may sound like a modest revision, but even if the Monolith Update were restricted to a simple map swap, its effects would be huge. And Monolith is no simple map update. 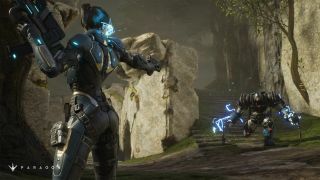 Epic has rebuilt Paragon’s systems from the ground up, albeit in a similar image. The Monolith Update which went live this week revises almost every single mechanic in the game to some degree. Travel mode is a thing of the past, energy and physical damage have been replaced by basic attack and ability damage, all abilities across the board have been sped-up considerably, and whole game elements, such as harvesters, have been completely cast aside. The V.35 patch notes read less like an update and more like a manual for a new game. The desire for a more “action heavy” MOBA is immediately obvious after a few minutes on the new Monolith map. After dipping our toe in the new setup pre and post release, it’s clear how impactful the update’s revisions have been. Monolith’s shorter cast times and increased movement speed transform the game’s character. Where Gadget’s sticky mines once calmly hovered to their target location without urgency, they now click into place in near-instant fashion. Steel’s ultimate, once telegraphed by a war cry and pause, is now a click-and-slam ability. The game’s more leisurely pace is now frenetic, fast, and shares far more DNA with its top-down cousins. Epic wants fights to conclude sharply on both macro and micro levels. On the latter, the developer has undoubtedly achieved its goal. Far less time is spent trudging between locations and waiting on the bench, and far more involved in the nitty gritty of lane aggression and teamfights. Monolith is designed to support this new play style, with shorter distances between objectives and more opportunities to engage in traditional MOBA tactics. Shadow pads have been removed, and replaced with ‘fog walls’ which obscure the area between lane and jungle, effectively providing fog of war between different positions. Jump pads near the core allow players to launch themselves quickly back into a the fray, and because the map is smaller, respawn cooldowns have also been reduced. Far less time is spent trudging between locations and waiting on the bench, and far more involved in the nitty gritty of lane aggression and teamfights. The total experience is both familiar and foreign. The returning bowl shape of Legacy still grants vision down the lane, but gone are the wide open spaces of yore. Tighter corridors lend the map a more claustrophobic feel than its predecessor, and sense of palpable danger which Legacy lacked. Height also plays a more important role than ever: where Legacy’s high structures often felt redundant, Monolith creates more accessible plateaus from which assaults can be launched, and be launched they shall. You’re far more likely to encounter foes quickly within Monolith’s more modest reaches. It’s in these action-heavy moments that existing players are in for the real shock. Battles on Legacy were an invigorating jog, but skirmishes on Monolith are a breathless sprint. Reduced ability cooldowns, cast animations and space to roam combines with increased movement speed to create frenzied clashes that resolve with haste. It’s unclear exactly who benefits from the new status quo; carries have a harder time finding their mark, making them more vulnerable, but much of their damage has now been loaded into basic attacks and removed from their other abilities. Who wins here? The answer is, quite possibly, whichever players have faster reflexes. Cameron is keen to remind players that heroes have generally been adjusted so that their playstyles on Monolith remain the same as on Legacy. “It looks like a lot has changed from ‘live’ and in a sense that’s true, but relatively speaking, a lot of heroes were changed to keep them the same if that makes sense.” For the most part this is true. Only Twinblast has undergone a true rework during the transition between maps. But subtle changes to rest of the cast, along with the myriad changes to the game’s underlying systems, alter the way these characters feel. Players who have been dancing along with a particular hero for months may now find themselves waltzing in an unfamiliar embrace. To have changed so much, so quickly, will inevitably have consequences for Paragon’s heroes that will only be discovered now that their updated selves are in the hands of the game’s sizeable beta audience. Take Belica, one of the game’s mid-lane casters. The radius of her AoE spell has been drastically shrunk, and her ultimate ability no longer does base damage by default. The result: she feels fiddlier, more situational, and harder to utilise effectively. Howitzer, on the other hand, has greatly benefitted from shorter cast times and a general increase in pace. His rockets now connect more easily, and mines can be used to deal damage quickly. He’s just a better hero, plain and simple. Even when changed at glacial pace, piece by piece, MOBAs exist in a state of constant flux, where seemingly innocuous adjustments can cause the meta to list considerably. To have changed so much, so quickly, will inevitably have consequences for Paragon’s heroes that will only be discovered now that their updated selves are in the hands of the game’s sizeable beta audience. Paragon’s latest costume change goes far beyond the adjustments listed here. New rotating buffs have been inserted into the jungle, the defensive area of towers has shrunk considerably, kills no longer drop amber for others to collect. The chances are, that if you name a mechanic, it has in some way seen the sculpting hand of Epic over the past seven months of Monolith’s development. The game that emerges from behind the curtain feels, at least upon first handling, so distinct from the Paragon of yesterday that some players will immediately rebel, but changes to competitive games require patience and a period of adjustment. Cameron, a principle architect of the overhaul admits that it took him somewhere between five and ten games to adjust. Other players will undoubtedly require a similar period, if not longer, to let Monolith’s new tempo sink in. Our feeling is that the changes are for the better. Positioning is more important than ever, fights are still dynamic, players are assigning more sensible roles to each lane (say goodbye to lonely supports with no backup) and assaults on the core are occurring with greater success. What remains to be seen is whether this full-scale makeover will net Paragon the broad church of gamers it desires. After spending most of 2016 in beta, Epic will at some point want to commercially release its labour of love. When it does, the real test begins.